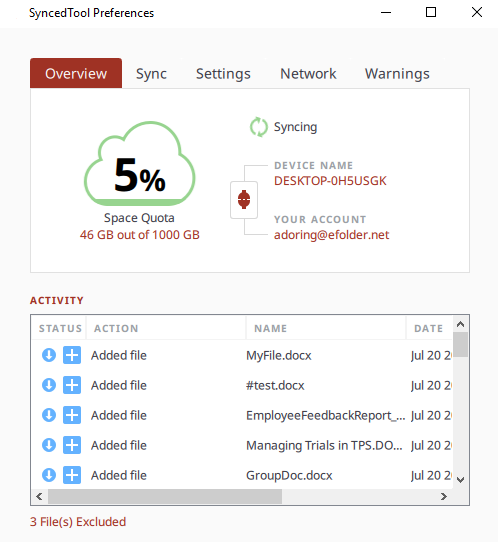 End users can access their files, folders, and shared content from a multitude of end points, including the web portal, a mobile device, or their desktop client. 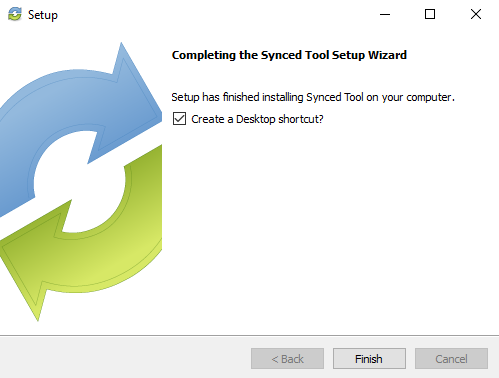 This article describes how an end user can install and register the Anchor desktop client (Synced Tool) on a local machine. It also provides instructions and best practices for using the desktop client, updating the desktop client, and managing preferences. Click the Download button in the web portal. In the Download page, click either the Windows Desktop Client button or the Mac Desktop Client button. The selected file will start to download, or you will be prompted to save the file, depending on your browser settings. 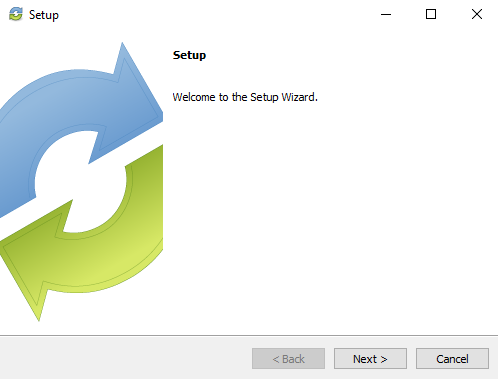 When the file finishes downloading, click the installation file to launch the Setup Wizard. Select your language and click the OK button to continue. 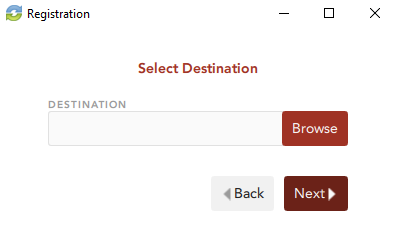 Click the Next button to start the Setup Wizard. 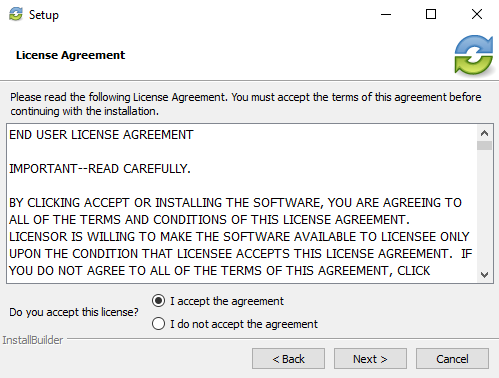 In the License Agreement page, click to accept or not accept the agreement. To continue with the installation process, you must accept the agreement. Click the Next button to continue. 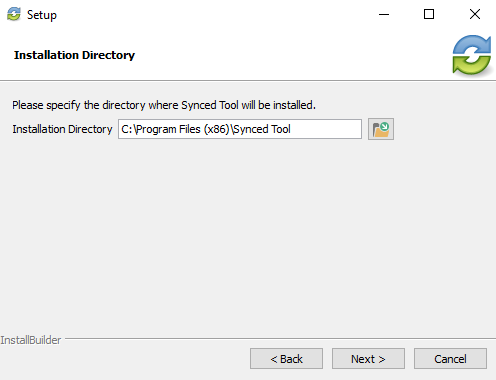 Specify the directory in which you would like to install Synced Tool. In most instances, you can accept the default installation directory. Alternatively, manually input a new directory or click the Folder icon to select a new directory on your local machine. You are now ready to begin the installation process. Click the Next button to start the installation process. When the installation is complete, you can optionally choose to create a shortcut. Click the Finish button when you are done. 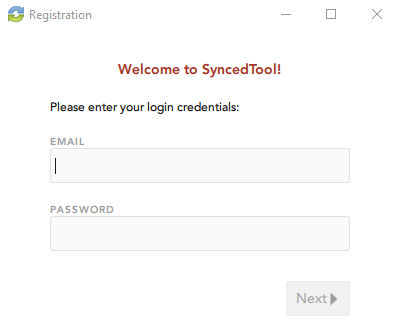 Now that Synced Tool has been installed, it must be registered to a user account. Note: Guest accounts cannot register the desktop client. After the Setup Wizard completes, the Registration Wizard will automatically launch. Alternatively, click the system tray icon and select Register. The Registration Wizard displays. Note: On a Windows machine, the Synced Tool icon is located in the lower right-hand corner of the screen; on a Mac machine, the Synced Tool icon is located in the upper right-hand corner of the screen. In the Registration screen, enter the email address and password provided by the Welcome email and click the Next button to continue. Note: For information on how Active Directory users register, please reference the How Do Users with AD Credentials Log In and Register Knowledgebase article. 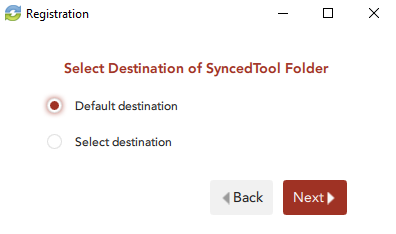 In the Select Destination of Folder screen, choose either a typical or advanced installation path, where all files, folders, and shares can be accessed on your local machine. 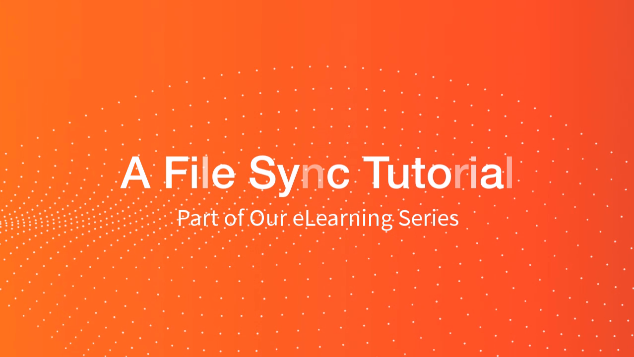 In most instances, you can select Default, and you will be able to access your synced folder in the following location: C:\Users\[User Name]\Synced Folder. Alternatively, you can specify a custom area where Synced Folder can be accessed. For instructions, please reference the Changing the Location of the Desktop Client Knowledgebase article. 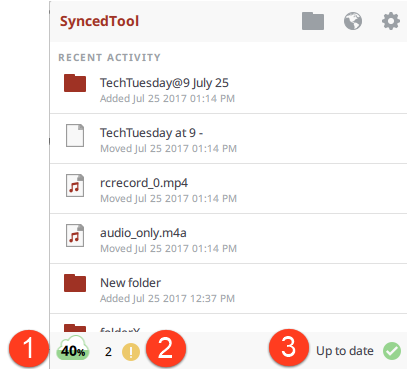 Best Practice: When selecting a Synced Folder location, do not select an external drive. Desktop clients install on an external drive can unregister unexpectedly, and might lead to data loss. 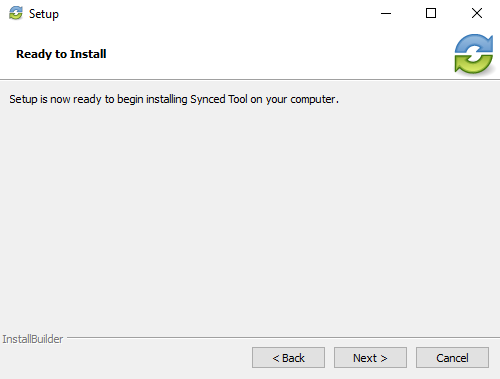 If you have previously installed Synced Folder using the same settings, you will receive a warning message indicating that a folder already exists. Click the Merge button to merge with the existing folder, which saves time during the resyncing process. In the Choose Folders for Selective Sync screen, click the Select what to sync to this device now radio button to deselect content that you do not want on your local machine. For instructions, please reference the Selective Sync Knowledgebase article. Click the Next button to continue, and then click the Finish button when the wizard completes. Important: You must restart your computer to complete the installation or upgrade process. 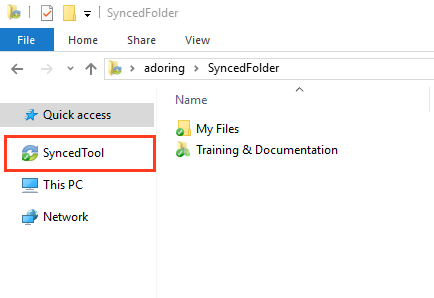 By default, your synced folder is located at C:\Users\[User Name]\Synced Folder. Your synced folder is also listed under the Favorites menu in Windows Explorer. Click the system tray icon, click the Manage icon, and select Preferences. The Preferences dialog box displays, showing the Overview tab. Note: Depending on individual graphic card settings, the Preferences dialog box might not render as expected. 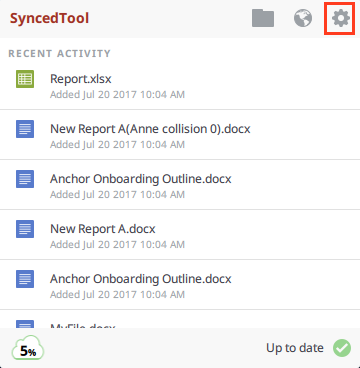 Click the Sync tab to select and deselect the Team Shares, personal folders, and subfolders that you do not want available on your local machine. You can also use the arrow buttons on your keyboard to navigate this screen. For more information, please reference the Selective Sync Knowledgebase article. Click the Language drop-down menu to select your preferred language. You can also use this section to hide or show the system tray icon and notifications. In the File Locking section, click the Auto Locking drop-down menu to set your preferred auto-locking preference. If your administrator has turned on the Auto-Locking for Word and Excel feature for a Team Share, you can decide to automatically lock, never lock, or receive a prompt each time you open a Word or Excel file in a Team Share. 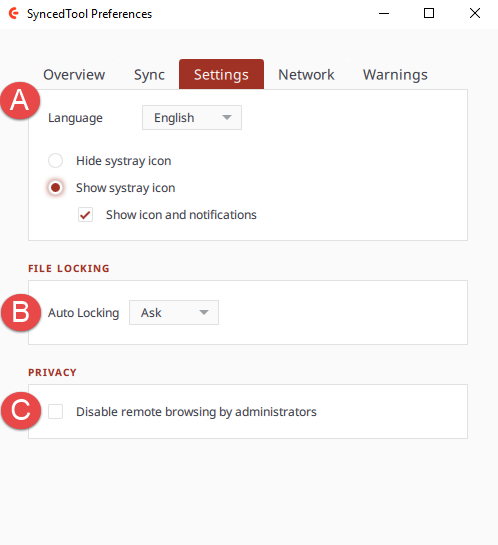 In the Privacy section, click the Disable Remote Browsing checkbox to prevent administrators from remotely browsing the contents of your Synced Folder (for example, to create a backup of your local folders). If you are working within a Local Area Network (LAN), click the Enable LAN Sync check box to turn on the LAN Sync feature. LAN Sync refers to a file synchronization approach that accelerates the sync process when a shared file already exists on a LAN. For more information, please reference the Managing LAN Sync Knowledgebase article. Use the Bandwidth Throttling section to configure bandwidth settings; you have the option to set a specific limit, or decide not to limit bandwidth. Please note that these settings might change based on administrator settings. For more information, please reference the Configuring Bandwidth Throttling Settings Knowledgebase article. 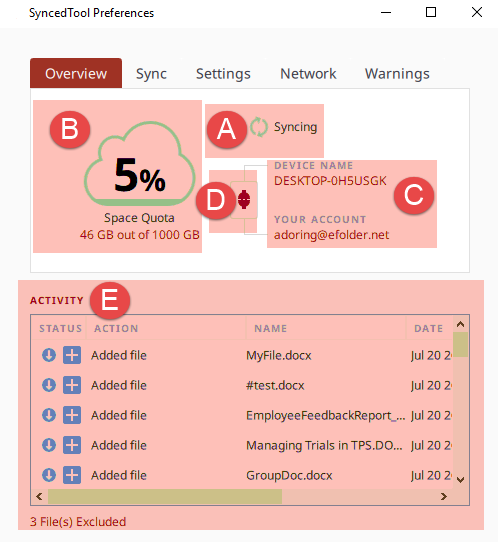 Click the Warnings tab to view a list of file sync warnings including conflicts. 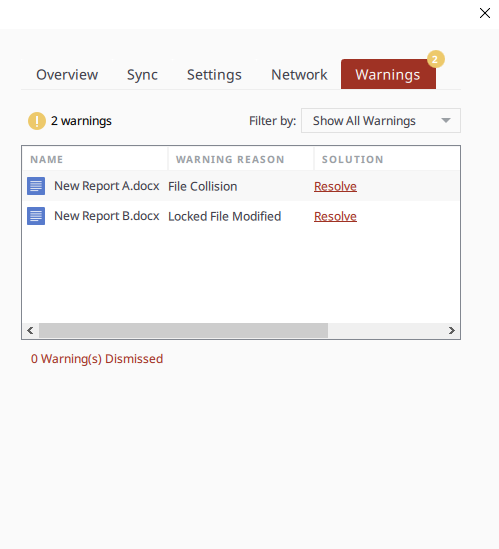 For more information on how to resolve file sync warnings, please reference the Manually Resolving a File Sync Warning Knowledgebase article. Warning messages captured in the Warnings tab also display in the system tray menu. To view a summary of these indicators, click the system tray icon and reference the system tray menu. The Space Quota indicator message displays the amount of space you are currently utilizing. The Sync Warnings indicator activates when a file sync warning—such as a collision or a locked file revision—occurs on your local machine. When this indicator is active, click to resolve the file sync warning. For more information, please reference the File Sync Warnings Knowledgebase article. The Status indicator displays the progress of the sync process. This indicator will alert you when the sync process is up to date, syncing, paused, or disconnected. You can also hover over this indicator to enable pause and resume functionality.